Removes temporal flickering from the Source clip. For example, old footage with uneven exposure times can be smoothed out with this effect. To use this effect, first position the rectangle over an area where the average brightness should remain constant. A middle or light gray area is best for this. Then select a Source frame that has the desired brightness within the rectangle, and hit the Set Hold Level button. When other frames are processed, their brightness will be scaled so the average brightness within the rectangle is equal to the Hold Level. You can keyframe different Hold Level values over time to account for desirable brightness changes. Source: The current track. 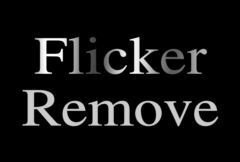 The clip to remove flicker from. Rect Corner1: X & Y, Default: screen lower left. The upper left corner of the rectangle which is used to measure the flicker, in screen coordinates. Rect Corner2: X & Y, Default: screen lower left. The lower right corner of the rectangle which is used to measure the flicker, in screen coordinates. Set Hold Level: Push-button . Pressing this button has a side effect of setting the Hold Level parameter to the average Source brightness in the rectangle at the current frame. It causes the output to equal the Source at this frame. This button retains no value itself, and is turned back off immediately after being pushed. On AVX2, this button sets the value at the current time, creating a keyframe if necessary. On AVX1, it sets the value at all active keyframes. To animate the Hold Level on AVX1, you must create all the keyframes first, then set the value at each one separately. Hold Level: Default: 0.5, Range: 0.01 or greater. The requested average output brightness for the area within the rectangle.